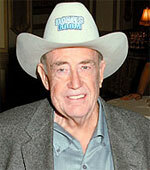 Doyle Brunson Doyle Brunson, aka "Texas Dolly," is a legend in the game of poker. A two-time WSOP Main Event winner (1976 & 1977), Brunson has won ten championship bracelets to date. He was the first player to win a million dollar poker tournament, and is well known for his comprehensive book Super System, in which he chronicled his poker strategy. This book has influenced many players and is considered one of the definitive manuals for playing—and winning—at poker. In fact, the book became so popular that Brunson had to change his game strategy because other players had learned his secrets. Born in Longworth, Texas, in 1933, Brunson began playing poker while attending college at Hardin-Simmons University in Abilene, Texas. When a knee injury ended his dream of playing professional basketball, he began earning money by playing poker. After earning a master’s degree in Administrative Education, Brunson took his only “regular” job, but gave it up shortly after receiving his first paycheck. Since he knew that he could earn more money playing poker, he took to the roads to play professionally. For years, he traveled around his home state of Texas with other professionals such as Amarillo Slim Preston and his mentor Johnny Moss. After finding it difficult to join games in Texas, Brunson moved his wife and four children to Las Vegas. Today, he is known not only for his skills at playing tournament poker, but also for his skills at playing high-stake games—two entirely different worlds that few players are able to successfully navigate. He established an online poker room named what else ... Doyles Room in 2004. The poker room bounced from network to network for a few years then was finally acquired by Americas Cardroom in 2011. While in college, Brunson was drafted to play professional basketball for the Minnesota Lakers until a knee injury ended his career. The "Doyle Brunson" is a ten and a two of any suit, which are the pocket cards that won him the WSOP in both 1976 and 1977. His son, Todd Brunson, is also a very successful professional player. In 2005, he won his 10th WSOP gold bracelet. In 2004, he was inducted into the Poker Walk of Fame. In 2004, he won The Legends of Poker World Poker Tour event.